THANKS TO THE MANY ENTHUSIASTIC PARTICIPANTS AND THOSE WHO CHEERED FROM THE SHORELINE!!! On May 10th Roy Sorensen, Salem’s Director of Municipal Services and then Senator Chuck Morse gave an update on the additional water source proposed for Salem. The Canobie Lake Protective Association requests all residents of Salem to JOIN and SUPPORT the efforts of the Town of Salem to fully support the proposed pipeline and buy-in to the max reserve water allocation. This is a "too good to be true" and "once in a lifetime opportunity" for an increased supply of water to meet the water needs of the future. 1. The State of NH is going to pay for the main pipeline. It would bring treated water from the Manchester water department down route 28 to Salem, for distribution to Salem, Windham, Atkinson, Hampstead and Plaistow. Actually, the State has a special fund from the MtBE legal settlement that will pay for the pipeline. So no taxpayer money is required, from either the state or the local communities that will benefit. 2. Each of the towns mentioned above needs a reliable source of clean drinking water. A regional solution, such as this one, offers better reliability and economy than multiple individual solutions. And making use of the MtBE settlement funds is a once-in-a-generation opportunity. 3. Salem needs an additional source of water for its municipal water system. NHDES has been urging this for 20 years. Salem has looked for additional sources of water and has not found any as attractive as this. 4. Salem will have an opportunity to reserve a portion of the capacity of the main pipeline. "Reserve" means to get an allocation that will permit Salem to draw up to a certain number of million gallons per day. Salem doesn't have to use it all right away, but they can. Initially, the allocation would be 0.3 mgal/d and after the treatment plant in Manchester is expanded Salem would grow to 1.5 mgal/d. Salem and the other participating towns need to pay a one-time up-front fee to reserve their allocation. Senator Chuck Morse advocates that Salem should reserve the max allocated amounts. That would give Salem a secure water future. The CLPA agrees. It will also reduce the chances that Canobie Lake and Arlington Pond might be overdrawn in the future. The Weed Watchers Program lead by Stephen Bortone shared the following information. 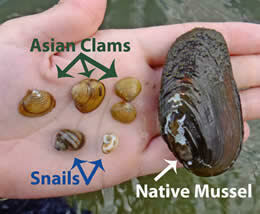 A report from NH DES that the Asian Clam has been reported from Canobie Lake by DES staff. (https://pjj52.app.goo.gl/dQ2BphERj01VNvhr1) It was first seen in NH from Merrimack in 2012. If you look at the point on the map (https://pjj52.app.goo.gl/Gyq5jv0kt3ThVLnJ2) and enlarge it you will note that the location for the clam in Canobie Lake is near the boat launch site on the north shore. I am not sure if this is the exact location. See the attached reference pictures, (not pictures from findings in Canobie Lake, but in Lake George, NY), indicates its relative size and color (although that can vary). Not sure what we can do about it except to be aware that it is present in our lake and to let us know if you see something like this. Salem's Municipal Services Director, Roy Sorenson, will be giving an update on how the additional water source for the southern NH communities is going. This presentation is on May 10th starting at 6:00 pm at the Searles School and Chapel function hall. This is a public meeting and open to all who are interested learning more. The proposed Southern Route found in the Weston and Sampson water study report would not only help solve Salem’s need for additional water but adjacent communities for their future growth (Hampstead Area Water Company, towns of Windham, Hudson, Litchfield, and Derry). The CLPA along with The Arlington Pond Association has gone on record in support of the proposed Southern Route. We hope you will join us at the meeting to learn more and demonstrate support. Such vibrant colors explode across the shorelines of Canobie Lake. Thank you to Pat Macoul for sharing this wonderful photo shot from the shoreline by Salem's Water Pumping Station. Safe Yield is the maximum amount of water that can be withdrawn annually, safely, from a lake used as a municipal water source. It is equal to the amount by which the lake recharges in a drought year. If you withdraw more water than the Safe Yield the lake will not fully recharge in a drought year. If the drought persists the lake will become lower year after year, and there won't be enough water to continue. 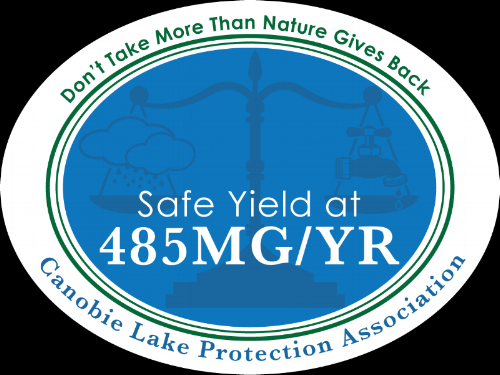 The safe yield for Canobie Lake has been calculated to be 485 million gallons per year, MG/y. In each of the last four years Salem has drawn more water than the safe yield. The years 2015 and 2016 were drought years. Salem placed restrictions on outside watering in 2016. The CLPA Board has brought this situation to the attention of Salem town leaders. We believe that Salem must acquire additional sources of water, so they don't continue to overdraw Canobie Lake. Salem is currently doing engineering studies looking at several possibilities for getting more source water. The CLPA will continue to encourage Salem to follow through, and acquire additional source water. Ginny Campiola, who is on the Board of the CLPA, thought you might be interested in this article (click "read more" below) since she has seen turtles crossing the road near her house on West Shore Road. She is trying to get the association to sponsor and have some “Turtle Crossing” signs posted. Please let her know what you think. She can be reached at [email protected] . (Jay Johnson) and our host at the award dock (Scott Buttram). About ten days ago a piece of flotsam washed up on the shoreline in Windham and we would like to get it back to whomever may own it. It looks like a piece of a dock. It's about 4 x4 feet and made out of2x4s. The leadership of the CLPA will review the actions and steps that they have taken, to date, to address the severe situation. The projections of the lake levels and anticipated use from Salem will be reviewed. The proposed commercial developments in Salem will be reviewed relative to the impact on the expected increase in water amounts drawn from Canobie Lake. Salem Board of Selectmen Meeting Has Been Canceled-2/27!! We just received word that the BOS meeting has been canceled tonight (2/27). We will let you know when we will be attending a meeting to voice our concerns regarding the water usage issue in the Town of Salem.